Nose: There's immediately bonfire smoke on the nose accompanied by a fruity sweetness of peaches and apricots. Vanilla's coming through, mixed with smoked ham and a slightly herbal note. The alcohol isn't pungent at all. Palate: Bold and intense on the palate. Now the high alcohol content becomes noticeable with a significant peppery note. Then sweet with fruits and vanilla while the warming spiciness of pepper, alcohol and smoke is becoming dominant here. After the warmth fades, creamy notes of sweet apricots, peaches and grapes linger towards the finish. Finish: The finish is long, warm and creamy sweet with apricots jam, followed by slightly bitter grape seeds and a whiff of dry smoke. With water: Becomes a bit fresher on the nose when a splash of water is added. The fruitiness is tamed a bit while more bonfire smoke comes to the fore. Still intense on the palate. The warmth, however, fades quickly leading creamy and sticky sweet notes of apricots and peaches to the fore. The finish is medium long with more fruity sweetness and a bit of smoke on the tail. Comments: A strong Highlander with an alcoholic bite and a clearly peppery spiciness on the palate. This is, however, very nicely softened by a wonderfully fruity sweetness, caused by the creamy and marmalade notes, which the first-fill Madeira hogshead delivered. 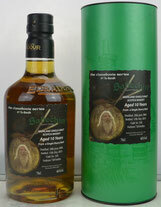 A slightly smoky, harmonious single malt which can tolerate some water. I thank Juergen Schneider from Whiskyhort for the complimentary sample and the photograph! Nose: The nose starts off with smoked ham, dry sherry notes, oranges and raisins, acacia honey and bonfire smoke. Slightly medicinal with herbs and hints of cough syrup in the back. Palate: Bold and intense on the palate. Smoky and spicy at first with pepper, ginger, cloves and oak. Very warming. Sweet and tender fruity notes of cherries and plums arrive, nicely mixed with dry sherry. Oily and minerally with phenols, hints of salt and cough syrup towards the finish. 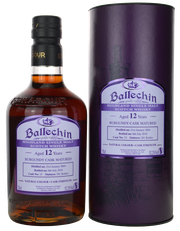 Finish: The finish is long, warm and subtle sweet with plums and hints of barley sugar. Drying smoke on the tail with a bitter herbal touch. With water: On the nose, water tames the smoky and fruity character, bringing more sooty flavours to the fore. More sweet and less spicy on the palate with lingering fruity notes of cherries and plums. Slightly warming with a soapy touch. The finish is a bit shorter, soapy with smoke, and a touch of fruity sweetness. Comments: An exciting Highlander displaying a fascinating interplay of smokiness, sweetness and spiciness. Rich, nicely complex with depth. 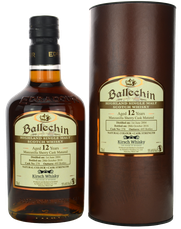 While oily, earthy and greasy neat, water opens this dram underlining its fruity and sweet character. Certainly a perfect choice for cold winter days. Nose: Fruity with sour fruits, wine aroma and cereals, nicely interwoven with wet wood smoke. Delicate notes of smoked ham arrive garnished with a mix of sweet and sour red berries. There's subtle sultanas with a tender peppery note and a whiff of marzipan in the back. Palate: Bold and intense on the palate. Wine gums mixed with coal dust, a light cereal note and a very warming spiciness of pepper and subtle oak. Dark cherries and plum jam, accompanied by smoked ham and a hint of peat. Noticeable dry with adstringent oak towards the finish. Finish: The finish is long, warm and creamy with wine gums and slightly bitter grape peel. Drying smoke on the tail with noticeable adstringent oaky tones. With water: There's significantly more smoke coming through with a few drops of water. Red berries and cherries dominate, pushing the smoky and peaty flavours in the background. Less sweet, less fruitiness and subtle warming but very dry on the palate. Adstringent oak and dry smoke dominate. The finish is medium long, warm, subtle sweet and very, very dry. Comments: A reliable Highlander displaying a good and delicate array of flavours. The smoke is beautifully balanced with the sweet and fruity aroma of the Burgundy cask. The nose is gorgeous. But maybe the wine cask has imparted too much intensity as the adstringency of the oak is disruptive to my palate. Nonetheless, a bold and chewy single malt for after dinner. With water, however, this dram becomes dry as a bone! Nose: Wood smoke mixed with coal dust and a hint of peat on the nose. Fresh with a light cereal note and a touch of sweet sherry coming in over the top. 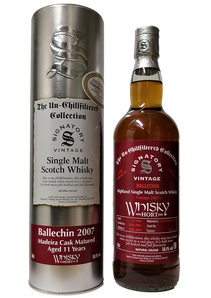 Palate: Rich with sweet notes of dates and raisins, followed by a bold and intense warming spiciness of peat, tender smoke, oak and nutmeg. Sweet barley sugar and subtle smoked ham nicely intermingle with spicy acacia honey and tender cinnamon towards the finish. Finish: The finish is medium to long and warm with a dry sweetness, burnt caramel and a touch of peat smoke on the tail. With water: Dry, smoky and slightly medical on the nose with a splash of water. Oak and ginger in the back. Less sweet on the palate with more phenolic character, cloves and oak spice. Dry and slightly warming. The finish is short to medium long, less sweet, dry, and somewhat warming with spicy notes of acacia honey, peat, and a hint of smoke. Comments: A nice smoky whisky from Edradour. Bold and young with a peaty character. Good balance of sherry derived flavours and oak spice. Lacks some complexity, but a promising spirit though. Best to enjoy neat.